Chronicles of Nushy: Should I just get the iPad Mini and put an end to this tablet misery? Should I just get the iPad Mini and put an end to this tablet misery? And it is...very, very light indeed. I think this is the ideal size to a portable tablet. The small size comes with another advantage. You don't have to strain your fingers while reaching for the keys when typing. Still, it is not as easy as on a phone, but I guess it is because I'm not used to the form factor yet so I'm willing to give it the benefit of the doubt. However, you cannot hold it and type with just one hand. But that should be obvious. It is hard work even on a big screen (4.5-inch plus) Android phone, so it should be impossible on the iPad Mini with much larger screen. I used the iPad Mini without comparing it with the big iPad and I didn't notice any performance deficiencies. It felt pretty smooth and snappy as every iDevice in their fresh state. But knowing how my iPhone 3GS and 4S got slower overtime with aggregation of apps and user data, I am not so comfortable with the specs of the iPad Mini. It has the same CPU as my iPhone 4S (albeit slightly faster) and same 512MB RAM. That's a big no no. iPad Mini already feels outdated in my book. I am a speed-whore and I just cannot stand the feeling of how slow this is going to get over time. The biggest concern people have is the non-retina display. To tell you the truth, if you don't compare it side by side with a retina display, you won't miss it. (You will definitely feel that text could be sharper, but it is not much big of a deal.) I read some sample books and I didn't feel any strain. I cannot tell whether the same can be said for an extended session of reading. Don't forget that although the screen resolution is same as that of the iPad 2, the smaller size gives it better DPI and this DPI seems good enough to read text comfortably. Most people are thinking that the next generation model will come with a retina display, but I don't know if that will happen in the next iteration. I should say few things about holding the iPad Mini by two hands. The slimmer bezel is not a problem. I can hold it comfortable without covering a portion of the screen. All thanks to the lightness, you don't need a big grip to hold it in place unlike the iPad Retina. If you hold it in one hand, of course a portion of the screen will get covered. I also checked the thumb detection feature. It works pretty well too. I don't know if it will interfere with any specific app though. iPad Mini or iPad Retina? Or something else? What happened to the Surface Pro dream? Looks like the Surface Pro will have many many problems. It is gonna be very heavy (about 3 times the weight of an iPad Mini) and it will have less than half the battery life of iPad Mini. 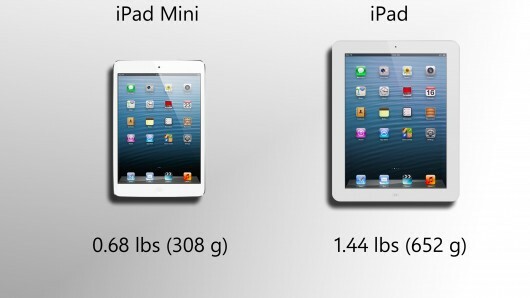 And it will be at least 3 times more expensive than the iPad Mini. There are rumors about a Surface 2 under development. Maybe I should get the iPad Mini now and get the Surface (Pro) 2 later?